The special Metrolink train service allows fans to avoid traffic jams and save on gas and money by skipping the car trip and parking fees. Service to Anaheim’s ARTIC station, immediately adjacent to Angel Stadium of Anaheim, will run from Los Angeles Union Station and the Laguna Niguel/Mission Viejo station for weeknight home games starting at 7:05 p.m.
Service from Riverside is also available for Friday night home games, with a transfer at the Orange train station to ARTIC. Angels Express trains arrive at least 30 minutes before game time and the return trains leave 30 minutes after the final out. The regular price is $7 round-trip, with discounts for seniors and disabled riders ($6), and children ages 6 to 18 years ($4). Children 5 and under ride free with an adult fare. To celebrate the start of the regular season, OCTA is hosting a pre-game Kickoff Rally at the Irvine Metrolink Station, 15215 Barranca Parkway, on Friday, April 10 – prior to the Angels home opener against the Kansas City Royals. The kickoff celebration begins at 4:30 p.m. and will feature free snacks, music and prizes. The first 100 fans will receive Angels Express gear, while one lucky winner will get a V.I.P. package that includes four game tickets. Attendees are encouraged to bring a non-perishable food donation that will go to Second Harvest Food Bank for a chance to win Metrolink tickets and other prizes. 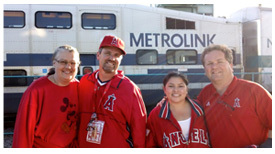 Angels Express trains will depart Irvine for the game at 5:10 and 5:59 p.m.
Last year, more than 44,000 fans got to an Angels game by using the service, which is made possible again this season by a nearly $240,000 grant from the Mobile Source Air Pollution Reduction Committee. For more information, visit www.octa.net/angelsexpress.